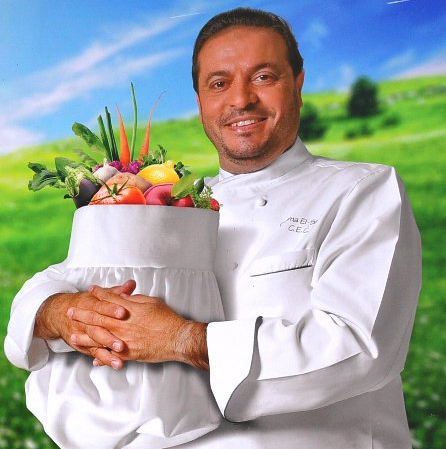 Chef Osama El-Sayed needs no introduction in the Arab world. With over a million fans across seven continents, Chef Osama’s television shows have been educating the audience with a vast array of cooking styles that have kept in mind the simplicity levels required home cooking. Image taken from the Chef Osama Twitter page. “Ma Osama Atyab” (It’s More Delicious with Osama) is a daily show on Dubai TV. Chef Osama has also published a number of cook books, and has regular columns in a number of prestigious publications. Chef Osama has recently been appointed the brand ambassador for the DeLonghi Multifry. Being an advocate in the field of cooking, Chef Osama loves the versatility of this product and believes it should be renamed the ‘multi cooker’. It’s been an honor interviewing this culinary genius. Read on for more about Chef Osama. He’s also been kind enough to share a recipe for Moroccan Hareera Soup with us! How did you get into the world of gourmet cooking? Please share a brief on your career as a celebrity chef, and how you ended up on Dubai TV. After graduating from the Hotel Technical Institute in Cairo, I moved to the USA in 1980 where I studied culinary arts at the Hiatt Management Group. I also taught there, and later spent a decade in one of America’s largest catering companies; Martin’s Caterers, located in Maryland. This gave me great exposure to world cuisines, and I wanted to share this experience with my family and friends. I started doing cooking shows in my home kitchen, and it soon turned into a studio! Then I went on TV in 1991 before satellite channels existed. I worked for ANA (Arab Network of America) for twelve years, then I joined MBC in 1993. I stayed with MBC for over a decade, and have now been with Dubai TV for ten years. I have a passion for cooking and learning more about it, and I like to share this passion with people. Who has been the greatest influence in your style of cooking? There have been far too many influential people; good cooks and even the bad ones as they have taught me what not to do! Most men say the best cook they’ve ever known is their mum. Is this true in your case as well? What was your favorite childhood dish from your mother’s kitchen? A mother feeds the child, and is therefore the first point of reference. Her style of cooking may not be the same as an aunt’s or even a wife’s and it is therefore very difficult for someone else to take the place of a mother when it comes to food or otherwise. From my mother’s kitchen, I enjoyed her Egyptian style vegetarian dishes best. Given you are Egyptian, how has the traditional style of Egyptian cooking influenced the dishes you create? My Egyptian heritage does not influence my other creations as I do not believe in fusion cooking. For me, fusion is confusion! If I am cooking for Egyptians, I will give them good authentic Egyptian food. Likewise at an Italian wedding I will try my best to impress with truly Italian flavors. However, if I were to start my very own restaurant, I will try to give the dishes my own personal touch! What is the most memorable dish you have created so far, and why? I have created over 1300 dishes for Dubai TV so far, and another 1000 dishes for MBC. Every one of these are like my sons and daughters. Each are special in their own right and I cannot narrow down to just one. Is your wife a good cook? Or does she leave the kitchen to you? At home, the kitchen is my wife’s kingdom! I just go home like any other husband. Even if she is serving me nothing more than a cheese sandwich, I know it is wise not to complain! You are the brand ambassador for DeLonghi MultiFry. Why have you chosen to endorse this brand? What dishes have you created using this new product so far? I always go with the best. The DeLonghi MultiFry is not just a fryer. I wish I could change the name to ‘multi cooker’. It can cook with minimum oil. It can bake, cook, boil, make gratin and can be used as a movable convertible oven. So far I have created over 60 dishes using this wonderful gadget, and I am happy to take up the challenge to cook any given dish with it. What is your favorite Iftar treat? Please share the recipe! My favorite Iftar dish this year is a Moroccan Hareera Soup. It is a hearty soup, yet perfect for summer. Heat olive oil, and saute the parsley, coriander and onion. Add the beef and lentil. Cook. Add the chikpeas, turmeric, paprika, salt and pepper. Add water or broth along with the tomato paste and tomato juice. Cook till meat is tender, and soup should be of a thick consistency. Eating this soup with a few dates to break iftar is a perfect meal in itself. Posted in Meet the Chef, People and tagged arabic cuisine, chef, chef talk, dubai, food, UAE. Bookmark the permalink.